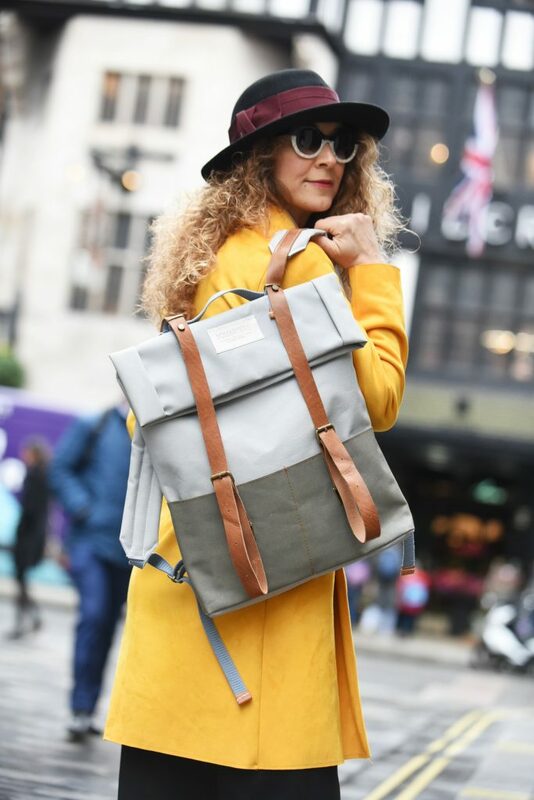 Sustainable fashion during London Fashion Week for your fashion style. Ecology, Fashion, Sustainability a common idea of 3quarters.design about the urge to choose and do it well, to do it together, to make sense and to create beauty. Choose now to take time to think, to feel, to discover fashion during London Fashion Week (LFW) in February 2018 that affects your daily lifestyle. Stop for a minute and think. Above all, take the risk and be ready to act now! Apart from attending as a fashion stylist and fashion blogger London Fashion Week (LFW) in February 2018, It is only now that in some cases I felt the need to give value to new fashion content concerning my daily lifestyle. 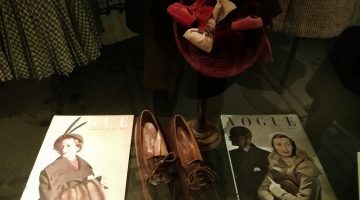 Sustainability and Ecology in everyday life involve fashion and this idea has already started to affect my personal way of thinking about my style. Lately, I discovered that the most important for me is to just follow my own aesthetic and as a part of enjoying fashion I had the honor once more collaborating with 3quarters.design for my fashion style during London Fashion Week. Make your choice and discover now New handmade material design ideas by 3quarters.design inspired by upcycled leftover. Take your risk and imagine your bag style, minimal, easygoing, fresh and stylish inspired by sustainable fashion. Open your eyes and see. Finally, the desire to achieve prove the courage to create. Handmade, Upcycled, Local: These are the three words that frame the essence of 3quarters. design who raise awareness on slow, ethical, socially and environmentally conscious fashion. Lately, It was lovely to meet them in Athens Greece where they are based and share with me their absolutely original style. In my eyes, It all starts with a new material idea and 3 quarters design they choose to upcycle leftover and used awning fabrics straps into minimalist, functional bags. Besides, I love to collaborate with emergent designer brands who dare to bring, as well as, their useful revelation about the pattern, color, and design. Attending lately London Fashion Week in February 2018 and enjoying the idea to feel natural, simple, energized by the tonal purity of grey color. Think about it and be ready to discover an absolutely original style for your backpack bag. Feeling Calm, embracing modern lines without hard edges. Stop and enjoy the luxury of a design that is admired both for its beauty and for its functionality. On my last Fashion Week fashion style, I loved to realize that those brave new things are coming to change our styling decisions. 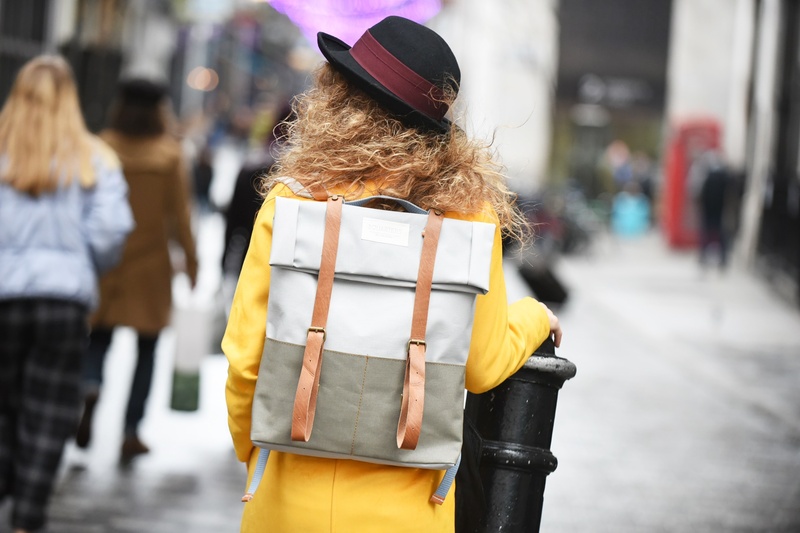 I’ve finally chosen for my fashion style the Pale grey of 3quarters.design modern urban handmade upcycled backpack. Above all, Pale grey is my favorite color for my city look. It makes me feel calm, stylish, cool, modern and always in style at any fashion event. 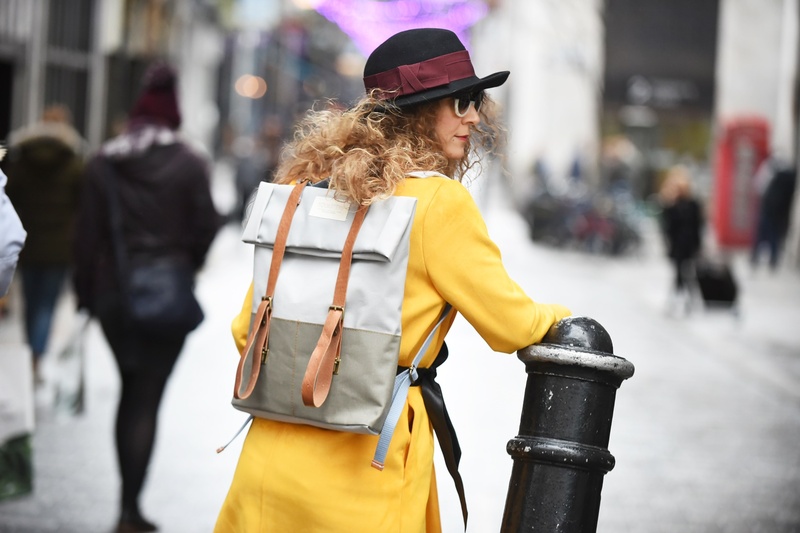 Besides the idea of an expandable, sturdy and waterproof handmade Backpack bag reflecting my current interest in all sorts of original accessories ideas. At the same time, having a fully padded laptop sleeve and a quick access internal pouch make it ideal for everyday use at fashion events. Colour in the front scene. Do not be afraid, Yellow is smiling! Have you noticed that it suits perfectly with your blacks? After all, you always choose to discover your Fashion Week Style! While for any of my styles, color always captures my attention. Biological colors create balance and harmony. 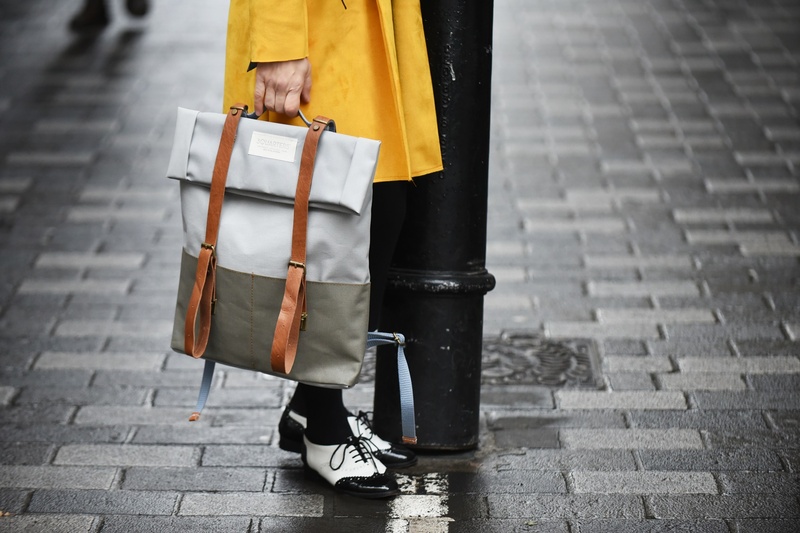 Thus, I discovered that the solar honey yellow color of my raincoat adds light to my final outfit and suits in perfect harmony with my black trousers and my classic white shirt. Apart from the color, I love to mix up men’s style details like vintage retro male shoes. They seem to be great for any fashion week style. By Chrysanthi Kosmatou, February 19/2018.